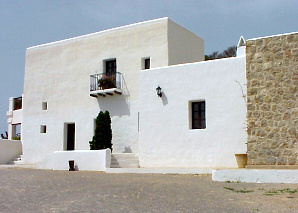 The Museum of Ethnography of Ibiza, situated in Can Ros des Puig de Missa in Santa Eulària des Riu, offers a historic-ethnological exhibition of the culture, the economy and the popular customs of the Pitiüses Islands. Opened on May 1 in 1994, its objective is the recuperation and investigation of everything relating to the rural areas of the Pitiüses Islands, holding exhibitions of all the heritage material that is being recovered. The Can Ros house is the nucleus of the well known family of the same name and one of the largest properties in Santa Eulària des Riu. At present it belongs to the Fundació Illes Balears, the entity that the Consell d'Eivissa i Formentera collaborates with and that restored and adapted the old country home to be able to house the new museum. The Museum dedicates a permanent room to utensils and jewellery, another to all kinds of tools relating to working the land, and one to miscellaneous objects. A walk round the house offers other exhibitions such as the wine cellar, where everything relating to the elaboration of wine is exhibited; the kitchen, where the women carried out their part of the work; the 'trull' or oil house; the sleeping house; and the upper porch from where a spectacular panorama of the municipality and the coast can be seen. More over, the Museum holds temporary exhibition, organised and sponsored by the Consell d'Eivissa i Formentera, such as the exhibition of "Capells i Espardenyes" (capes and sandals), the basic traditional accessories; and the exhibition of "Imatges i Maquetes Etnogràfiques", where they are presenting pictures and models that reflect the characteristic elements of the Pitiüsa heritage. An in the summer, the Museum hosts a group of craftspeople demonstrating their skills in making musical instruments, wickerwork and traditional clothes.